Viktor Pelevin’s Omon Ra is a novel set in the post-lunar landing era of Soviet cosmonautics. It is the aetiological narrative point that we can follow through to the space program’s inevitable decline in the form of the Mir space station saga, which really seems to sum up other post-Cold War Soviet aspirations. This comic book sense of decline provides the tone for Dorney’s adaptation of Pelevin’s novel, and for Kieran Swann’s design of the Restaged Histories project’s production of Omon Ra. The Soviet space academy is a junkyard, strewn with electronic contraptions—vacuum cleaners, tape recorders, flotsam and jetsam from various conked-out machines—hailing from decades already slightly more dated than the 1970s ‘present’ they are representing. The narrative ostensibly follows Omon (Anthony Standish) and best friend Mitiok (Leon Cain) as they compete to enter the academy’s training programme for a lunar landing. In essence, though, the piece is more of a philosophical reflection on the human soul. Russian sci-fi, if Pelevin can be read as paradigmatic, is a popular forum for theosophical interrogation in the Godless (post) communist state. Omon’s journey, he learns, is to be a suicide mission: futile and humorous. His journey to the dark side of the moon (and yes, there are Pink Floyd gags here) is also a journey to the dark side of the human soul: that black space where, especially in an atheist culture, questions of transubstantiation, reincarnation or the life hereafter cannot be answered...well, not until you’ve been there. 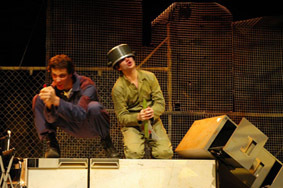 Director Nic Dorward attacks Dorney’s text with characteristic zeal, and the ensemble cast (which also includes Jonathan Brand and Christopher Sommers) is very strong, providing kinetic, intelligent performances that are most impressive when they are engaging with the piece’s droll Russian humour. There is evidence here of meticulous rehearsal room interrogation of the script’s physical potentialities. This has become the company’s trademark, in a sense—the thread of continuity that links the refreshingly disparate histories that the company seeks to restage. For all the verve and passion inherent in the team’s approach, there is still a confused quality to the work that cannot be put down to frenetic interpretation or adaptation of Pelevin’s original text. I’m the last person ever to advise Dramaturgy 101 to theatre-makers, but there is some forensic dramaturgical microsurgery needed here to help clarify narrative strands and some basic premises of the action. Other sections (like the space flight itself) are too long and ponderous, and impede the narrative flow just as the play—like the Soviet space programme, and Omon himself—should be hurtling toward its conclusion. Still, it’s reassuring to watch a group of dedicated emerging artists commit themselves to boundary-stretching and eclectic text-based theatre. Hell, I’m just glad to see someone tackle sci-fi on the Brisbane stage! There is a ‘European’ feel to this company’s aesthetic (and repertoire) thus far that reminds me a bit of the sort of theatre that was taking place at the Gasworks and Napier Street theatre spaces in Melbourne in the 90s. The company deserves the support and attention it is currently receiving and, with some astute and unsentimental dramaturgical excision, should hone this piece into the sharp, chaotic piece of sci-fi absurdism it promises to be.